Things are going to be a little quiet through next week as I’m starting production on something for a few days. In the meantime, amuse yourself with scans of delicious sandwiches. Food for thought (or comments, hint, hint). In this day and age of “gourmet” sandwich ingredients, is the concept of the sandwich itself obsolete? There’s a great local bakery which makes a roasted vegetable sandwich with five types of hand-roasted vegetables, smoked provolone, and a home made garlic aoli on thick fresh-baked bread. When I eat each element individually they are truly epicurean delights. When I eat the sandwich? I taste yams and lettuce, the two largest ingredients (by taste intensity and surface area respectively). Yet, by prying my sandwich into it’s component parts it’s hardly a sandwich, it’s a salad with some bread on the side. 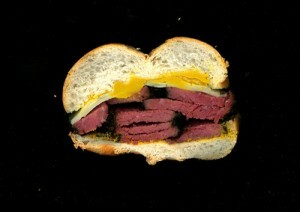 The sandwich was borne of an era with ingredients of middling quality, where it’s delivery mechanism alone was unique. I certainly don’t think the sandwich is done, there’s still nothing to beat a pile of smoked meat on rye (maybe a little sauerkraut), but a graph correlating increasing number, or quality, of ingredients against “overall sandwich enjoyability” would be interesting. What is the critical mass of a sandwich? I won’t be getting on that any time soon. Discuss, and I’ll see y’all in a couple of days. I think we’ve had this argument before… and I still say you’re nuts. The combination of different ingredients makes the sandwich more than the sum of it’s parts. If it isn’t, then the right ingredients aren’t being used, and it’s simply not a great sandwich. Combining things into a sandwich is great but there is definitely a breaking point as shown by this web site.